Banking and insurance organizations are gradually evolving to meet the digital demands of a rapidly changing marketplace of tech-savvy, mobilized and millennial consumers. Yet many firms remain plagued by manual processes that result in operational inefficiencies, customer dis-satisfaction and risk of non-compliance to regulatory requirements. 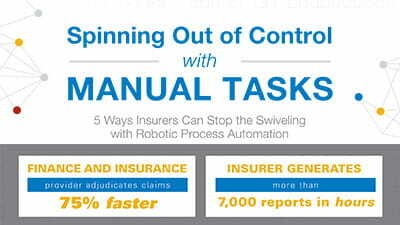 In fact, 34% of financial institutions and half of U.S. insurers still rely on manual data entry tasks. 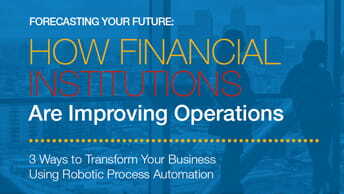 By leveraging robotic process automation (RPA) to streamline key business processes, your organization can speed services and accelerate revenue realization. Kofax RPA for banking and insurance enables you to automate repetitive, manual tasks for collecting and inputting data between portals, websites, internal applications and your core systems. Automatically process digital content, apply validations and route information electronically to accelerate processing and increase customer satisfaction. Improve efficiencies and free up your employees for more valuable and rewarding work by eliminating mundane, manual work. 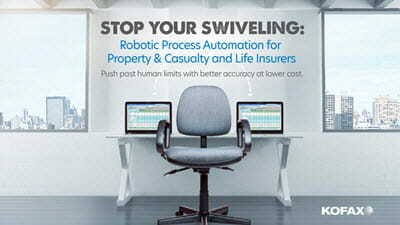 Deploy software robots to handle mortgage lending tasks efficiently. Monitor emails, process digital content from internal systems and reconcile data between your enterprise content management and loan origination systems. Automatically collect, cleanse and validate loan data to approve applications quickly and generate revenue faster. Automatically perform required checks of an individual’s background to ensure compliance with Know Your Customer (KYC) and Customer Due Diligence (CDD) regulations. Verify a customer’s identity quickly and easily against watch lists and public record databases for faster onboarding of new accounts or loan approvals while reducing risk. Extract and aggregate regulatory updates from hundreds of global websites and portals—and deliver the information directly into the hands of your bank employees. Get real-time access to data in any application and eliminate the need for employees to manually log into multiple systems to track down information. Enhance responsiveness with tighter integration of email, call center applications and your core systems. Gather precise data related to the applicant for new property, life and auto policies. Obtain DMV records for an auto policy or relevant medical histories for a life insurance policy quickly and easily to better assess risk. Increase efficiencies by automating claim verification and integrating required data, regardless of the source. Input the First Notice of Loss (FNOL) quickly. Provide automated notifications to loss adjusters and assignments to claims handlers.